1. Place the strawberries in a bowl, sprinkle with 25g of the vanilla sugar and set aside. 2. Whisk the egg whites until stiff, then gradually beat in the remaining sugar until firm and glossy. 3. Pour the cream into a separate bowl and with the same beaters (there's no need to wash them) beat until the cream forms soft peaks but is not too stiff. 4. Mash the strawberries with a fork, then fold them into the meringue mixture with the whipped cream. 5. 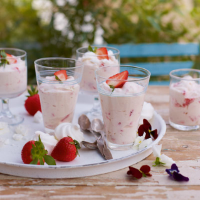 Spoon the mousse into wide glasses or small dessert bowls and chill for an hour or two. When ready to serve, top with the mini meringues and a light dusting of icing sugar. This recipe contains uncooked egg whites and is therefore not suitable for the young, pregnant women, elderly people, or those whose immune systems are weak. For the latest guidelines, visit food.gov.uk.